Have you ever dropped your keys in the dark or came home to find the porch light busted? Do you know how hard it is to read a map or a compass in low light conditions? If you have answered yes to any of these questions you were probably thinking “where’s a flashlight when you need one?”. Finding things, navigating or setting up camp in the dark can pose many problems; some of them very dangerous. During these situations, you need the best EDC flashlight to make your life more comfortable and easier. The term EDC stands for Everyday Carry. For most of us, flashlights are only needed during power outages. However, having an EDC flashlight with you all the time can help prevent accidents and improve your survival rate when you’re backpacking or camping. Depending on the features of your flashlight you can also defend yourself or signal for rescue during camping or backpacking decisions. There are a lot of EDC flashlights available in the market and it can be confusing to choose the best one. But don’t worry because in this blog we will help you understand and identify features that are important when choosing an EDC flashlight. We will also check out reviews from past users who have brought some of these products so that we can see how they work in real life situations. Let’s get to it! To most of us, a flashlight is just a flashlight. It helps us see better in the dark. But EDC flashlights are different because they are small enough to be carried in your bag or backpack so that you can use them in any situation. Unlike penlights, EDC flashlights also have better illumination and have other features like strobe function that can help you increase your chances of survival outdoors. Don’t just buy the first product you see, consider these features so that you can buy the best EDC flashlight most suited for your needs. Most EDC flashlights will give you a maximum number of lumens. Basically, this refers to the maximum amount of light your flashlight can produce on its highest setting. Generally speaking, the higher the lumens the brighter the flashlight. Regular flashlights usually have are usually around 10 lumens. EDC flashlights on the other hand range from 100 lumens while high-end EDC flashlights can produce up to 18,000. It can be hard to determine how many lumens you need so it’s best to consider how or where you will be using your flashlight. 10 – 50 lumens flashlights are alright for personal or home use. If you’re going to use it for outdoors it’s best to have at least 100 lumens since the absence of artificial light will make the environment darker. Hiigher lumens flashlight will also improve your visibility in an emergency situation outdoors. Most EDC flashlights use AA or CR123 batteries. AA batteries are readily available in many stores and are a reliable source of power for many flashlights and gadgets. It is also very affordable and is considered as the gold standard in batteries so a pack can be used not only for your flashlights but for other gadgets too. CR123 batteries are lithium cell technology and provide greater energy storage which results in brighter and longer lasting flashlights. These batteries are more expensive than AA-sized batteries and are shorter in length and have a wider diameter, so their usage for other gadgets is limited. However, these batteries are lighter which can result in a lighter flashlight. For most EDC gear size is very important. When you’re backpacking and hiking space is a premium, so you want a flashlight that is small enough to carry on your backpack, vest or pants. Nobody wants to carry a bulky flashlight on their everyday kit or camping gear. Look for a flashlight that is small and compact. In our experience, it is best to find an EDC flashlight that is less than 4 inches long but has good illumination. It can be tricky to find a small flashlight with high lumens since it can be hard to fit more than 1 battery cell in a small product. Just like the size you don’t want to be stuck carrying a heavy flashlight for everyday use. Even if you carry it in your handbag for emergency purposes, heavy flashlights can add unnecessary weight. This is even more important for backpackers since they will be hiking for long periods of time and carrying a heavy pack can get tiring very quickly. When choosing an EDC flashlight with low weight, look for products that use lightweight materials like aluminum or titanium. Flashlights that use CR123 batteries can also help you save on weight. Most flashlights of yore used incandescent bulbs to make dark corners brighter. Incandescent bulbs are very common so they are easy to replace. They are also affordable and reliable sources of light. Generally, incandescent bulbs use AAA, AA, C and D batteries. LED (Light Emitting Diode) flashlights are becoming the norm. LED bulbs are favored not only for lighting options but for flashlights too, because they are more power efficient, smaller, have better battery consumption, longer lifespan and provide brighter lights compared to other bulb types. It uses alkaline or Li-ion batteries. As you can see there are a lot of features you need to consider when choosing the right EDC flashlight to match your needs. Focusing on the features you need makes it easier for you to select a flashlight so you will have the best EDC flashlight available in your kit. Reading consumer reviews of EDC flashlights can give you a glimpse of how they work in real-life situations. It will also cut the time you spend browsing and looking for the best products. Take a look at our short review on EDC flashlights so that you can consider them for your choices. Description: If you’re looking for a small and tactical flashlight, the Armytek Partner C2 Pro Flashlight is a good choice. Lumens rating for this product is a whopping 2,000 using the Cree XP-L LED bulbs. It uses TIR-optics for smooth, light beam without sharp edges with no-tunnel-vision effect even after continuous use. The C2 Pro uses a solid and impact-resistant body so you’re confident that your flashlight can survive even a 10-meter impact. Despite its 2,000 lumens rating, this product has a run time maximum of 18 days on 1 18650 or 2 CR123A batteries. It is compact in size and width 134 mm in length and weighs only 71 grams making it an ideal choice for your EDC kit or camping and backpacking gear. Furthermore, it is water and dustproof with the IP68 rating and- submersion up to 10 meters deep. Aside from the batteries, purchase of the C2 Pro includes O-rings, clip, holster, 2 rubber buttons and lanyard. Other features include special signals (strobe), low battery indicator, high-temperature indicator, auto memorization of the last mode used and battery over-discharge protection. Related: The C2 Pro comes with a holster, but the Columbia Sportswear Silver Ridge Vest can give you easier access and storage for your other gadgets. Aside from your EDC flashlight, this vest can store your GPS, maps and your personal Life Straw. It features zippered compartments and Omni-Wick Advanced Evaporation technology, so you don’t drown in your sweat while backpacking or hiking. Description: The Fenix XP-L Tactical Flashlight is pocket sized but is high performance. This is a good choice if you’re looking for a powerful and lightweight EDC flashlight. Lumens output at maximum is at 1,000 while weight without batteries is 0.89 grams. The aircraft-grade aluminum materials used by Fenix also adds to the lightweight feel of the flashlight. This product has different settings you can use depending on your needs. On turbo mode (1,000 lumens) it can last 1 hour, 10 minutes; high (500 lumens) 2 hrs., 55 min; mid (200 lumens) 8 hr., 30 mins; low (60 lumens) 29 hrs. ; 15 min and eco (8 lumens) for 140 hours. It also has a strobe function for emergency or rescue situations. Just use the stainless steel switch to select output mode under Outdoor Mode. Aside from being lightweight, this product is also built to last. It uses Cree XP-L(V5) LED bulbs with a lifespan of 50,000 hours. Aside from this, it also sports premium Type III hard-anodized anti-abrasive finish and toughened ultra-clear glass lens with anti-reflective coating. You don’t have to worry about water splashes because this product is rated IPX-8 standard, underwater up to 6 1/2 feet for 30 minutes. Related: Strobe lights can help rescuers find you in an emergency situation but they only work best in the dark. For daytime rescue situations use the Coghlan’s Four-Function Whistle. It is shrill sounding for safety so you can alert rescuers to your position. It also features lanyard with clip for attaching to a jacket or a backpack, magnifier, compass, and two-scale thermometer, perfect for outdoor and backpacking/camping use. Description: Do you need a flashlight and gadget charger? The ThruNite TC12 V2 Max Flashlight is a multi-functional tool that doubles as a charger and portable power source. This product has an updated stainless steel side switch to make the operation more sensitive and convenient. The TC 12 Max has 240-meter beam distance thanks to the CREE XP-L V6 LED bulbs. It uses 18650 batteries for power with intelligent overcharge protection. This product is a bit heavy, weighing in at 87 grams without the batteries and is a bit long at 140 mm. While this is clearly not a flashlight meant to be carried in your pocket, you can make some room for it in your backpack. It has different modes so you can select the lighting option best suited for your needs. At max lumens (1,100) it can last up to 3.6 hrs while the firefly mode (0.5 lumens) can last up to 49 days. Other features include 1-meter impact resistance, IPX-8 Standard (2 meters) waterproof rating, accessories such as the holster, 2 spare O-rings, lanyard, pocket clip and USB charging cord, one-key strobe and ITC technology to prevent the flashlight from overheating. Related: The TC 12 V2 can be heavy and bulky for your pocket but the G4Free Water Resistant Travel Backpack has more than enough room for your flashlight. It has a 40-liter capacity and is lightweight at just 12.7 ounces. Stow your flashlight on the front Spandex pouch for easy access. Description: The EagleTac D25C XM-L2 LED Flashlight is simple but powerful, just like an EDC flashlight should be. There are no complicated bells and whistles with this product but it is more than capable to do the job. The product has a 105 m beam distance and 453 lumens maximum output. On its lowest setting at 1 lumens, the flashlight can last up to 150 hours. It has an IPX-8 waterproof rating and uses 1 CR123A battery for power. Despite its simple design, the D25C XM-L2 has multiple hidden modes. Just click the switch to activate strobe, SOS, flash and beacon functions. 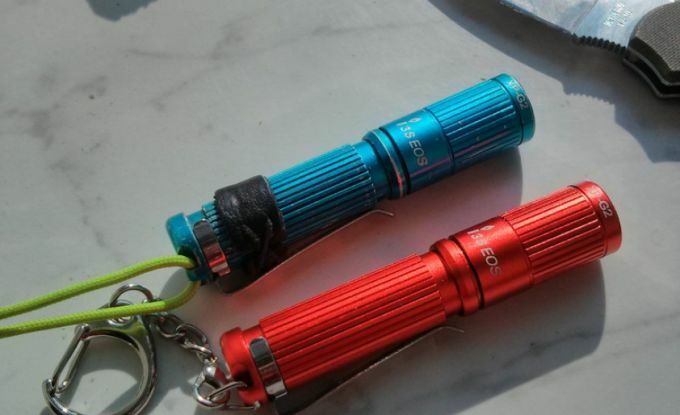 It is lightweight at just 29 grams and with 7.5 cm length, 2 cm body diameter and 2 cm head diameter, this product is the ideal pocket flashlight. While a bit on the small size, this product can be used in different situations. It is a good flashlight for outdoor use. It can also be used at home in case of power outages. Store one in your glove compartment for emergency use and carry one in your purse so you don’t have to rely on your phone for a flashlight during emergencies. Related: It’s best to have spare Tenergy 3V CR123A Lithium Batteries since the D25C XM-L2 has poor battery life on max mode. Enjoy high energy density that will last 3 – 5 times longer than alkaline during your camping and backpacking adventures. Description: If you’re looking for a good value EDC flashlight, look no further than the Olight XM-L2 950 Lumens Flashlight. It is priced affordably but does not lack the features or the lumens, unlike other cheap alternatives. It has an output of 950 lumens thanks to the Cree XM-L2 / U3 LED bulbs with a beam output of 142 meters. It weighs a respectable 50.5 grams without its batteries and is 4.06 inches in length. This is a good flashlight not only for outdoor use but for personal, home and law enforcement use too. Enjoy variable output with this product. It has 4 standard modes (950 lumens, 400 lumens, 80 lumens, 10 lumens) and 2 special modes (0.5 lumens moonlight mode and 10 Hz strobe mode) so you can choose from different lighting modes depending on your brightness requirements. It also features a built-in timer so the flashlight automatically shuts itself in 3 or 9 minute time frames. This product uses a single 18650 battery, making it a good choice for people who are looking for a small and compact flashlight. On turbo mode, the flashlight can last up to 2 minutes plus 100 minutes with 950 lumens illumination while 10 lumens operation (low mode) can stretch battery life up to 95 hours. It has an IPX8 waterproof rating with a 6061-T6 aluminum body with anti-scratch type-III hard anodizing material for the body. Related: Purchase of the above product does not include batteries so better include the EdisonBright EBR34 Rechargeable Li-ion Battery on your shopping list. It is reliable with over 500 charge-discharge cycles, is rechargeable and is best suited for flashlights and other drain devices. Description: The Zebralight MK3 Flashlight is an easy-to-use no-nonsense EDC flashlight. Cree XHP35 Neutral White LED bulbs so the intensity is easier on the eyes. It has 3 main levels (high, medium and low). It uses one 18650 battery for power. This product is small and compact with 64-gram weight and 30 x 25 x 96 mm dimensions. This is a good choice if you’re looking for an EDC flashlight for camping/backpacking, home, law enforcement and personal defense use. Other features of the product include built-in battery protections with continuously monitored temperature, battery capacity indicator, durable electronic soft-touch switch, a smart user interface provides fast and easy access to all brightness levels and beacon-strobes, durable natural hard anodized finish and tempered optical grade glass. The flashlight looks simple and is easy to operate which is advantageous during emergency situations. For basic operation, one click turns the flashlight on in high mode and another click turns it off. Two clicks turns it on medium mode while three on beacon-strobe mode. You can also Press and hold the button to turn on the light to low and then medium and high and then release at the desired level. Related: Buy a rechargeable 18650 battery for the MK 31126 and then get the Streamlight 18650 Battery Charger Kit so you never have to buy another piece of 18650 battery for a long time. Have your batteries recharged in approximately 3.5 hours. This is an economical alternative to buying disposable 18650 batteries. Description: The Fenix E12 130-Lumen Flashlight is a high-quality LED flashlight. It is practical and portable, making it suitable for everyday use. It provides up to 130 lumens while using a single AA battery. It also sports an exclusive design using aircraft-grade aluminum with an ideal grip for easy use. It has a tail-stand feature with a simple button interface that is user-friendly. Best of all, the flashlight uses a single AA battery which is easy to obtain. You can buy this type of battery almost anywhere or you can opt for a rechargeable one for environmental and economic reasons. It uses a CREE XP E2 LED bulb with a lifespan of up to 50,000 hours. The output on high mode (130 lumens) is 1 hour and 30 minutes, which is very good for a flashlight that runs on 1 AA battery. The E12 has good craftsmanship since Fenix employed professional engineers to design this EDC flashlight. Other features include reverse polarity protection, high-efficiency protection lens, compact and portable, durable and versatile, high-intensity adjustable beam and tail tap switch for easy off and on operation. Related: Don’t run out of juice during the most crucial situations with the EBL 4 Pack AA 2000mAh Ni-MH Rechargeable Batteries. This is an affordable alternative to disposable batteries, especially because it comes with its own charger. Enjoy low self-discharge to maintain 85% of capacity after 1 year of non-use. Charge all 4 batteries so you will be ready for any emergency situation. Description: The J5 Hyper V Tactical Flashlight is impact and water resistant. It has a powerful and blinding 400 lumens output with adjustable focus range for different usage. It is a good quality product with an affordable price tag and a heavy duty exterior. The main attraction of this flashlight is the 400 lumens LED bulb which can illuminate objects as far as 800 feet away. It also sports an adjustable focus lens so you can focus the beam and concentrate it on specific areas. This is a good feature when a narrower beam is needed to focus on a specific object in the distance. Some reviewers report that it can shine a beam of light the length of 2 football fields on a clear night. Other features of the product include tail tap switch, strike ring for a firm grip, in-curling surface for non-slip grip, attack head design, precision optics and aircraft grade casing. This product is small but intense and only uses 3 AAA batteries which can last weeks on low mode. Related: Make sure to stock up on Energizer AAA Batteries before your camping or backpacking trip. This 24-count pack will ensure that you don’t run out of juice outdoors, even if you’re using high mode. You can trust this brand to keep your flashlight and other gadgets safe from damaging leaks. This is where we end our reviews! When you’re looking for an EDC flashlight, it is best to find a device that is easy to use and has good lumens outage. Bright flashlights can be used to blind attackers so you can have extra protection in the streets or when you’re outdoors. However, do not compromise brightness for size. Bulky flashlights are heavier and harder to carry every day. Find a good balance between brightness and size so that you are always ready for power outages and low light situations outdoors. What did you think is the most important feature of an EDC flashlight? Do you think you will be buying any of our featured products? Tell us by leaving your comments below.